June 20, 2016 A new NOAA outlook shows that many coral reefs across around the world will likely be exposed to higher-than-normal sea temperatures for an unprecedented third year in a row, leading to increased bleaching – and with no signs of stopping. "It’s time to shift this conversation to what can be done to conserve these amazing organisms in the face of this unprecedented global bleaching event,” said Jennifer Koss, NOAA’s Coral Reef Conservation Program director. “We have boots on the ground and fins in the water to reduce local stressors. Local conservation buys us time, but it isn’t enough. Globally, we need to better understand what actions we all can take to combat the effects of climate change." NOAA is actively working with coastal resource managers and communities in coral reef areas to provide the best available science and tools to enhance reef resilience. The agency and its partners are also developing methods to assess the potential resilience of reefs so management officials can target and prioritize local conservation actions. 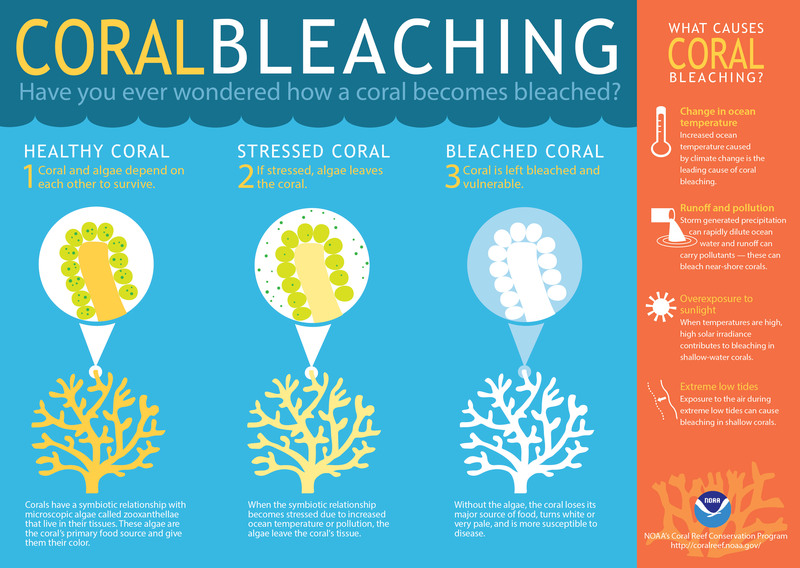 A bleaching event is not always a death sentence for corals. In fact, corals are remarkably resilient creatures. Just as a healthy person is more able to fend off a cold, healthy corals are more likely to resist large-scale stress like a bleaching event. Resilient corals that do bleach have a better chance of recovering if ocean temperatures return to normal relatively quickly and other human impacts are kept at a minimum. This week, the global bleaching event is on the minds of the world’s top coral reef experts as they gather for the 13th International Coral Reef Symposium in Honolulu where the focus is bridging science to policy to achieve coral reef sustainability. Panels and presentations about NOAA’s extensive coral reef portfolio will take place throughout the week. NOAA’s Coral Reef Conservation Program was established in 2000 by the Coral Reef Conservation Act to protect, conserve, and restore the nation’s coral reefs by maintaining healthy ecosystem function. NOAA’s mission is to understand and predict changes in the Earth's environment, from the depths of the ocean to the surface of the sun, and to conserve and manage our coastal and marine resources. Join us on Twitter, Facebook, Instagram and our other social media channels.